k-rated: The Most Famous Movie Scream Ever! In light of Scre4m’s release a couple weeks ago, I found it appropriate to blog about the most famous scream of all – The Wilhelm Scream. I f you've ever watched a science fiction, action, or horror movie, you have definitely heard it. I started paying attention to it more and more after my friend, Jason, pointed it out to me. I now hear it in almost every movie I see. 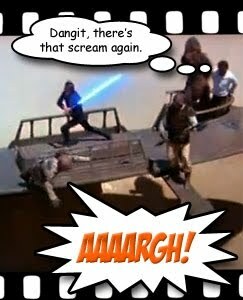 Despite its nickname, The Wilhelm Scream did not originally come from Wilhelm of The Charge at Feather River (although it was the first time it was repeated). Instead, it first screamed in an old Hollywood western, Distant Drums (1951). So who was the man behind the famous scream? According to Star Wars IV: A New Hope sound editor Ben Burrt, who first nicknamed it the Wilhelm Scream, it is likely the voice of Sheb Wooley. For those of you who have no idea what I’m talking about, you'll soon be enlightened as SlashFilm just released a new video compilation of nearly every instance this signature scream has been heard on film. Check it out and enjoy! he has provided a great treasure in pop culture.